DIY Splashbacks | About Us. Founded in 2009, DIY Splashbacks have been at the forefront of the glass splashback industry since it's very inception. In fact, we launched shortly after the first UK supplier (who sadly ceased trading around 5 years ago- we hugely respect them for making the industry what is is today) so we have perhaps the most experience and product knowledge in the industry. In 2015 we expanded into a second factory to cope with growing demand and have since gone from strength. Our growing workforce of skilled production operatives, technical support staff and customer service representatives are all fully trained to help guide you through the process from measuring, ordering and installing your splashbacks. As all of our splashbacks are manufactured in house, we are able to keep tight control over our products and most importantly- the quality of the product. Being in total control over our product is extremely important to us so we have invested in the best machinery we could source to ensure we consistently provide superior quality splashbacks. Automated paint mixing machine - In 2016 we upgraded our paint mixing machinery to move to a computerised system that can dispense incredibly small amounts of tint to ensure the highest colour accuracy. Our software has a regularly updated colour library with all the UK's largest paint brands. Our website lists only a fraction of the colours we can mix, so if you can't see the colour you're looking for just ask. 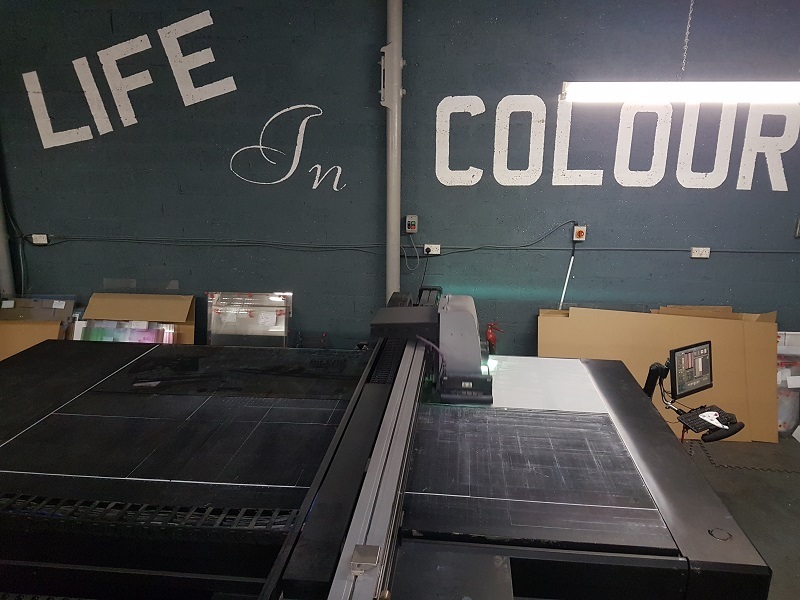 Large format UV Digital Printer - there's always room for improvement and although the print quality of our printed splashbacks was excellent, in 2015 we invested in what is considered the best machine in the industry for printing directly onto glass. Newer models have been released but industry experts still regard our model as the best- if that changes we'll certainly consider an upgrade as we strive to achieve excellence where possible. Second large format UV Digital Printer (2017) - due to increasing demand for our direct to glass UV printing (rather than the more popular vinyl backed sticker versions) we have taken on a second flatbed digital printer and design team. It also became necessary to add this printer due to some high profile commercial projects we would love to tell you about, but until these products are launched we cannot- but you will see them in toilets (for one customer) and showers (for another) across the world very soon. 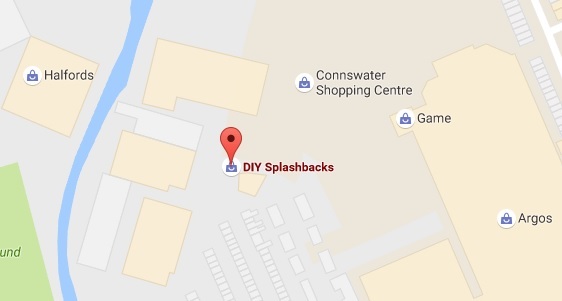 The first DIY Splashbacks high street showroom opened in Summer 2017 with another planned for 2018. Franchise opportunities are available for interested parties, for more information please contact us. Whilst the factory exteriors themselves are fairly generic, the inside of our factories have been transformed to streamline the manufacturing, quality control and dispatch processes. Everything we do is reevaluated on a regular basis in order to allow us to better serve you, the customer. Please feel free to write to us or pop in, we don't hide our address behind a PO Box! !